Leaks are super annoying! Not just that, they are also dangerous because they wreck the whole AC is they are not catered to immediately. Thankfully, there are a few options out there that we can explore to find the best AC leak sealer on the market today. 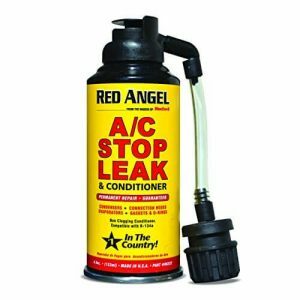 This lovely product from Red Angel is a blessing for those who need an immediate but not expensive solution to AC leaks. It is the perfect solutions for leaks in evaporators, gaskets, connection hoses, O-rings, and condensers. It is extremely safe and causes no harm to the recovery unit. It does not have any particulate or solid matter. Thus we don’t have to worry about clogging. It has an attached coupler, making it very easy to use. It contains 2.5 ounces of Freon. This will not work for a hybrid car AC. The product does not contain a dye. Users say that it works wonderfully for small leaks and repairs, enabling them to save a lot of money. This is a leak kit worthy of its name! It does its job wonderfully and ensures that the leaks are sealed without hassle. Versatile and affordable, numerous users vouch for the AC Pro leak sealer. It works well to seal leaks in gaskets, O-rings, and hoses. It also works to seal leaks in accumulators, driers, receivers, condensers, and evaporators. You can use it for R-134A systems without the fear of damage. The stop leak kit includes a recharge hose. It has a drying agent that removes all moisture from the AC. It does not contain a refrigerant. While it is a very good product, it may not do the trick if the leak is too big. One of the bestselling products on Amazon, the FJC 9140 Stop Leak works specifically for gaskets and O-rings. It is a safe product that does not damage the AC system or the refrigerant recovery. It can be used on a deep freezer, but it doesn’t work with hybrid car ACs. It will not work for pinhole leaks. You will need another sealant that specifically works for this purpose. Make sure you go through the directions and follow them carefully for this to work well. You need patience! 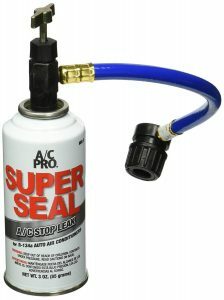 A few users have, however, complained that this isn’t the best AC leak sealer out there. In fact, it has damaged the POA valve in a few cases. Looking for a stop leak and detector that is compatible with R-134A lubricants? This is the one you should go for. It not only seals the leak but also ensures that you don’t lose any more refrigerant. It is an O-ring conditioner. It seals all the rubber leaks in gaskets and O-ring hoses. This product is meant only for automotive and should not be used for home ACs. It can be used on a hybrid system only if the hybrid uses Freon. Use automatic hoses that come with a pressure gauge so that you are safe while using the product. The product works to stop leaks by clogging the hole. Remember that this works only with small leaks and not bigger problems that need the mechanic. 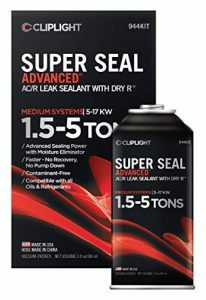 Even though this is on the higher end of the pricing spectrum, Cliplight Super Seal Advanced is a good choice because it does the job seamlessly. It is a sealant and a dryer. In other words, it is a 2-in-1 product, making it a reliable option. You can rely on it to seal all minor leaks in your refrigeration and air conditioning systems. It also helps prevent further leaks. The DRY R in the product helps remove moisture while improving efficiency of the system. It comes with a hose. You can use it with all refrigerants and oils. The company says that this product is mainly for professional HVCAR use only. It works well with R123a Freon systems. It is perfect for 1 to 1.5 ton residential AC systems. A few users have complained that the compressor locked up with hours of use. Thus, you might want to be careful to go through all the care and use instructions before you starting using the product. No matter which AC sealant you go for, it is important to know that each comes with different features, uses, and drawbacks. What may be a benefit for your purpose may actually serve no purpose for someone else. That’s why, instead of blindly relying on regular AC leak freeze reviews, we urge you to understand products in-depth and compare them based on what you are looking for. This kind of research will ensure that you don’t end up with something below par. Did our reviews help you? Were you able to solve your leakage problems with any of these? We’d love to hear from you.